This Coming Sunday! Birmingham Bass Night! …By which I mean it’s clearly going to be a basstastic evening, but you won’t have to be a bassist to have an amazing time! This isn’t an evening of tuneless bass wankery. It’s a gig, with excellent music, that on this occasion is made by people who play bass. Life is far too short for bad music. So there won’t be any on my watch. Here’s the Facebook event link. Go see what people are saying about it over there. Lots of people are looking forward to this gig. It’s going to be epic. Then… TELL YOUR FRIENDS! Lorenzo Feliciati – one of Italy’s most respected bass innovators, Lorenzo Feliciati’s combination of electric jazz with progressive rock and electronica elements, coupled to his amazing dextrous skill on the instrument, make for a compelling and exciting music-world. Receiving his initial impetus to play bass from seeing Jaco Pastorius with Weather Report, Lorenzo added Mick Karn, Pino and Percy Jones to his list of fretless-inspirations and forged a celebrated career as both a side-man and a band-leader in his home country, and further abroad. His latest project, Naked Truth, featuring King Crimson drummer Pat Mastelotto, brings together his twin loves of jazz and progressive music, and has been critically acclaimed worldwide. 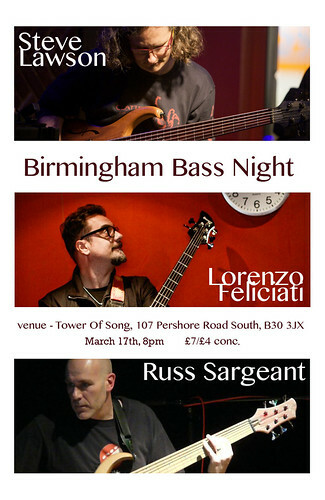 Russ Sargeant – Russ Sargeant is a bass player and multi-instrumentalist based near Birmingham. He uses live looping and effects to create beautiful layered music – sound upon sound; sometimes with multiple instruments but mostly only using electric and acoustic basses. His music is a blend of Ambient, Jazz and eclectic sounds and has been described as, “subtle layers of sound that emerge gracefully like cinematic soundtracks”.